Firstly, I could actually 3D print something in my home. Secondly, I could design the thing myself. Thirdly, I could personalize it by putting my name on it. Frankly, I was quite amused to read that email. But then I guess that’s because we in the CAD world take all this wonderful technology for granted now. I exchanged a few emails with the reader and answered a couple of his questions about Alibre Design, the CAD system that I used to create my iPhone stand. He wanted to design something and send me his model to 3D print on the Cube. I would like to introduce my new found audience to the the concept of parametric 3D design. 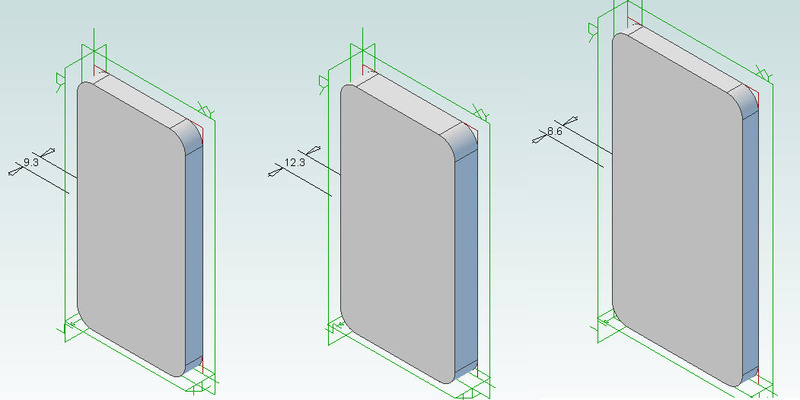 In short, the dimensions of a 3D model can be configured to respect certain rules. For example, you can make the length of a rectangle twice its breadth. If you extrude the rectangle into a box you can make the box height be exactly 50 mm. The length, breadth and height are called parameters. And when you change the values of these parameters you actually end up changing the geometry of the 3D model because the CAD software literally “cooks up” the geometry for you. I used the dimensions from Apple’s iPhone site to create a rectangle and extrude it to a box. I rounded the corners using fillets, fired up the Equation Editor of Alibre Design and renamed the parameters to better reflect what they measure. Alibre Design has this concept of configurations where you can create a different version of a 3D model by assigning different values to the parameters that drive its geometry. I renamed the default configuration to “iPhone 4” and created two new configurations called “iPhone 3GS” and “Galaxy S3”. For each of the configurations I set different values for the Width, Height and Thickness parameters in the Equation Editor to arrive at different geometries. The figure below shows the same 3D model in three configurations. Note that I didn’t have to create three different boxes. I simply changed the values of the parameters driving the dimensions of the box to give it a different size. I designed the phone stand in a similar way using parameters. As I said earlier about the length of a rectangle being twice its breadth, I set some parameters to depend on others. Observe the column titled “Equation” in the figure below. I created three configurations for the phone stand similar to how I did for the phone and set the values of Phone_Width, Phone_Height and Phone_Thickness for each configuration. The rest of the parameters driving the geometry of other parts of the 3D model depend on these three main parameters. This way I could get the same 3D model show up in three different sizes. Note that I “programmed” the base of the stand to grow along with the width of the phone slot. I also made its height increase along with the Phone_Height parameter. 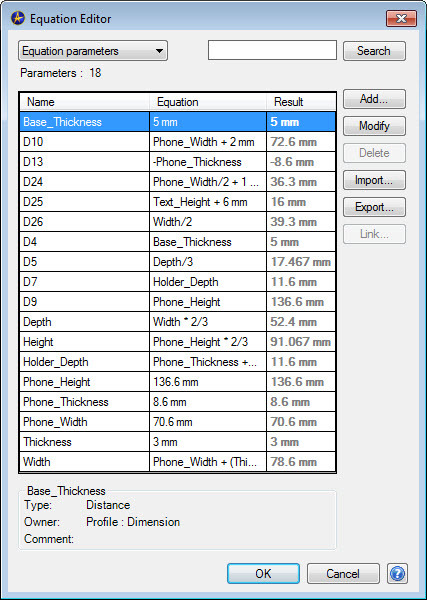 So if I want to come up with a stand for a different phone all I need to do is create a new configuration set appropriate values for the Phone_Width, Phone_Height and Phone_Thickness parameters. The rest of the model will adjust itself based on the rules that I have set in the Equation Editor.